There is a planned Dee paddle in June with a film show on the same day people can donate, attend or just donate. “The idea is we have a paddle down the river Dee to raise money for the relief effort for Nepal. 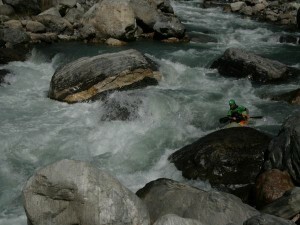 enjoying the great white water, having a great cheap holiday and loving the friendly face and generous Nepali people. It is now our turn to be generous. Suggested donation of a minimum of £20.00 (if we get 500 people we have raised £10,000. If we donate this to Community Action Nepal (CAN), Doug Scott’s long-running charity, we can get 25% added to this from the government. The Monsoon is arriving and it will get worse, the wheat crop need harvesting now and the rice need planting in the next month. The busy time of year and now the Nepali have to re-build their houses repair all the terraces. This is not a quick fix, this is going to take time and money, this not just about getting a few tarps and tents and rice and dhal to the stricken villages.